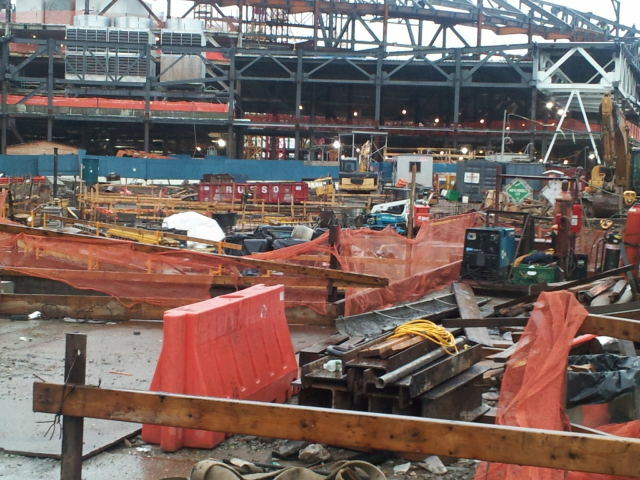 As Hurricane Irene approached yesterday, how well was the Atlantic Yards site secured? Brooklyite Eric Kuo tweeted at about 8:30 pm last night: "Atlantic yards construction site with equipment not tied down. #brooklyn yfrog.com/kl2jyfxj." The photo, shot at about 5:45 pm, shows the arena site. There appear to be two pieces of motorized equipment left uncovered, as well as materials--wood and metal--not tied down. Kuoalso tweeted: "Atlantic yards construction site, abandoned but nothing is tied down. 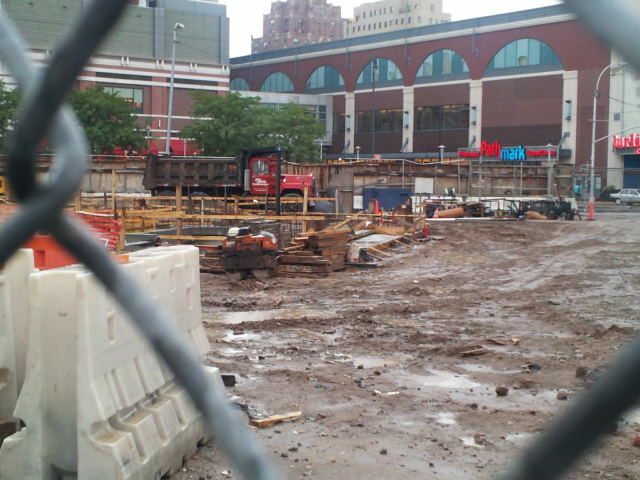 #brooklyn http://yfrog.com/j2z62dj "
The photo shows the site destined for a plaza, with materials not tied down. I suspect Forest City Ratner would say the site was "left secured" rather than "abandoned," but we'll see what the DOB thinks. 60-mph winds can lift the roof off a carport. 70-mph winds can turn a mobile home on its side if the mobile home is not anchored to the ground. 80-mph winds can lift the roof off a house. The National Weather Service, according to the Times, has predicted wind speeds of 55 to 75 mph today, with gusts of up to 80 mph.